The protest in Taiwan (pictured above) took on special meaning. Dynamic Precision — parent to the Guangzhou company — has announced plans to return its operations to Taiwan, cutting and running in the face of workers' demand for fair compensation on the mainland. There, labor groups including Taiwan Youth Labor Union 95 and the Taiwan Association for Victims of Occupational Injuries held signs reading, "The bad fish swims back to victimize workers in Taiwan," urging the public to refuse Dynamic Precision from bringing its dangerous working conditions back across the strait the divides Taiwan from the mainland. Read more on the Taiwan protest at Taiwan Focus (English) and at UDN.com (Chinese-Traditional). 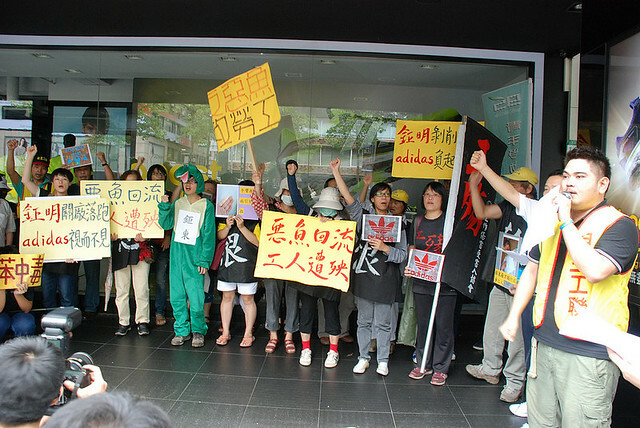 The protest in at the Adidas Hong Kong headquarters (pictured at right) brought together the Hong Kong Confederation of Trade Union (HKCTU), Globalization Monitor, ITUC/GUF Hong Kong Liaison Office (IHLO), Labor Education and Service Network (LESN), Student and Scholars Against Corporate Misbehaviour (SACOM), Labour Action China (LAC), Worker Empowerment (WE), Left21, and China Labor Net. 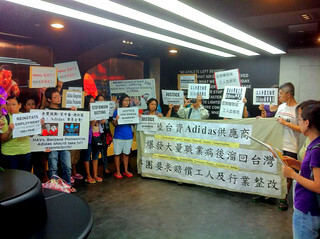 The coalition of groups took Adidas to task for failing to take responsibility for the basic safety of workers toiling at its contract factories. Hong Kong-based Globalization Monitor has documented 110 cases of workers at Dynamic Casting who suffered from Hand/Arm Vibration Syndrome (HAVS) and other serious occupational diseases due to a deplorable lack of safety measures in the plant. Last September, Globalization Monitor revealed documents showing management raised the factory's machines over the legal maximum speed to squeeze out the most production volume possible, at the expense of workers' long-term health. The Asian TNC Monitoring Network hosts an online petition where you can urge Adidas to compensate the Dynamic Casting workers demanding compensation for their injuries.